Pianist-composer Peter Madsen has always impressed me with his musicianship; in group interactions with bassist Mario Pavone or guitarist Michael Musillami, he is often a driving force with his forceful solos. He is equally at home in "free" sessions as he is in blues-based "swinging" tunes. Madsen moved to Vorarlberg, Austria, after he getting married in 2000 and immediately got involved teaching and performing. He assembled a group of musicians, giving them the monicker Collective of Improvising Artists (CIA) and began playing throughout Europe. Madsen began developing music for string ensembles, discovered a local theater troupe Dante's "Seven Deadly Sins" and decided to work with them. 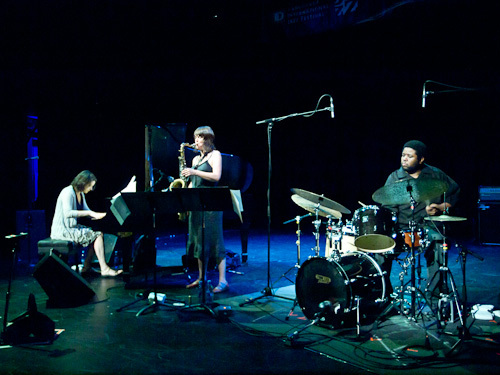 Thus was born the Seven Sins Ensemble which gave birth to Madsen's new Playscape recording, "Gravity of Love." The vast majority of the CD is given over to Madsen's "Dante Suite", 7 compositions separated into 3 sections, "Excessive Love", "Deficient Love" and "Malicious Love." The ensemble features Herbert Walser (trumpet, horns, electronics), Dominick Neunteufel (acoustic bass), Alexandra Lartseva and Monica Tarcsay (violins), Simon Frick (viola, electronics), Bianca Riesner (cello) and the splendid drummer Alfred Vogel. Vogel is quite impressive especially when he is pushing the music or "coloring" behind the strings, he seems to be "right". One of the more pleasing aspects of this music is the different "grooves" Madsen creates; whether it's the straight-ahead jazz of "Excessive Love: 1. Jealousy" or the splintered funk of "Malicious Love: 6. Excessive Desire". There are so many fine musical moments. Ms. Riesner's unaccompanied cello introduction to "Malicious Love: 7. Avarice" is a tasty morsel filled with plucked notes and a sly rhythmic pace. Walser takes a number of excellent solos, none better than his hard-edged lines on "Excessive Love: 3. Rage". There's the blues-infused "Deficient Love: 4. Indifference" with its heady blend of strings and brass that leads into a sparkling piano solo and a short yet evocative trumpet spot. The album closes with "Swiss Chocolate", a tasty confection that helps wash away the memory of all those sins. Walser takes the first solo, rising atop the percussive piano chords and solid bass work of Neunteufel. Madsen follows, his dancing lines underpinned by Vogel's active drumming. Not too sweet, just right, this piece is a pleasing ending to an impressive program. "Gravity of Love" is built on composer Peter Madsen's reading of "The Seven Deadly Sins" but the music is far from doom and gloom. In fact, this music sings with creativity and lively interplay, the intelligent arrangements setting off the fine solo work. One can hear that the Seven Sins Ensemble is a real working unit and not just a "studio" creation. Let's hope we hear more of this band! For more information, go to www.petermadsen.us. This music is perfect for "blasting out of the speakers", thanks to the booming mix of the rhythm section. There are moments throughout that one can hear the influence of Weather Report, especially in the interplay of the saxophone and synths as well as several of the melody lines, such as the sprightly "Says Who" and the ethereal melody over an intense yet fairly soft rhythm section on "Love Song For an Echo." McCaslin does not attempt to channel Wayne Shorter; he has his own approach to this "fusion" that blends a strong melodic tendency with a percussive attack (check his fiery interactions with Lindner on the appropriately-titled "Tension".) The cover of Boards of Canada "Alpha And Omega" lean more towards "electronica" with the saxophone playing a mesmerizing figure but never the melody line while the title track opens in the same direction yet McCaslin has more space to move melodically. Producer Binney contributes one original track, "Praia Grande", a richly textured track that displays the intensity the composer is well-known for, the rhythm section pushing forward with increasing strength while the saxophonist "wails" atop the counterpoint of the synthesizers and Binney's voice. "Casting For Gravity" is not music for the faint of heart; it's a striking group effort with compositions and arrangements that asks the musicians as well as the listeners to stretch their minds. Donny McCaslin is a musician who rarely holds back yet also rarely overplays; his solos display an imaginative architecture that often have an emotional pull far stronger than a technical one. With this group of Lindner, Lefebvre, and Guiliana plus Binney at the controls, this music soars, rocks, even soothes as it fills a room. For more information, go to www.donnymccaslin.com. Detroit-native and University of Michigan graduate Jordan Young, drummer by trade, has issued his 2nd CD as a leader. "Cymbal Melodies" is his debut for Posi-Tone Records and features organist Brian Charette, guitarist Avi Rothbard and, on several tracks, saxophonist Joe Sucato (a member of Young's "working" band.) The program consists of 6 "standards", a pair of jazz tunes, a cover of The Police's "Roxanne" and 2 original works by the drummer. The CD starts inauspiciously (to my ears) with a "poppy" version Jimmy Webb's "By The Time I Get To Phoenix" (yes, it's already considered a "pop" tune but this version sounds like the band is just getting warmed up.) The Trio stokes the fire much better on "Raindrops Keep Fallin' On My Head" with both Charette and Rothbard responding with plenty of vigor to Young's percussive prodding. Sucato adds his smooth tenor sax to a swinging take of Lee Morgan's "Free Wheelin'" but it's the excellent organ solo that catches the ear. Charette also takes the lead on Young's boppish "Bird Bath" (don't think it refers to Charlie Parker) - Rothbard, a native of Israel, digs into a strong solo as well. Perhaps the most successful cover is the fine re-arrangement of "Roxanne" - the band (Sucato is the lead voice) ignores the Caribbean/reggae rhythm of the original, building the piece on the swirling organ chords and Young's propulsive drums (he particularly shines beneath Rothbard's angular solo.) There's also a subdued but swinging saxophone-drums take of Irving Berlin's "Best Thing For Me Is You." "Subdued but swinging" is perhaps the best description for "Cymbal Melodies". The playing is quite good, the melodies are fine but it all seems to much of a "low-key" affair. However, if you dig the work of Brian Charette, he shines throughout. For more information, go to www.posi-tone.com. Firehouse Goes Dub + Dave Douglas "Be Still"
The New Zion Trio plays 2 sets - 8:30 and 10 p.m. (separate admissions) - and one expects the space to packed with fans of the hard-working Saft (he has worked with composer John Adams, Laurie Anderson and the Beastie Boys plus is a member of John Zorn's Electric Masada and Grizzly Bear.) For ticket information, go firehouse12.com or call 203-785-0468. 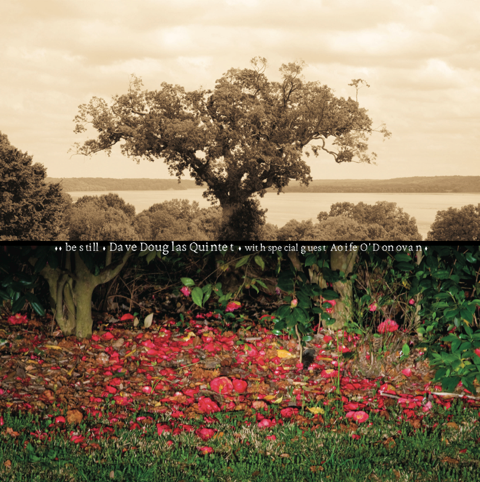 Her gentle voice is one of many reasons to find "Be Still", Douglas's latest recording for his Greenleaf Music label. As usual, the trumpeter is surrounded by stellar musicians including Jon Irabagon (tenor saxophone), Matt Mitchell (piano), Linda Oh (bass) and a subdued yet still adventurous Rudy Royston (drums). The trumpeter's mother was quite supportive of her son and attended as many of his concerts as she could - knowing what kind of music he played, she made suggestions understanding he would make them work in a way that was respectful to her wishes as well as his style of playing. The program is bracketed by 2 classical pieces; the opening cut, "Be Still My Soul", posits lyrics by the 18th Century hymn writer Katharina A. von Schlegel with music composed by Jean Sibelius while the closing track, "Whither Must I Wander" is a melody composed by Ralph Vaughan-Williams. In between, there is a bluegrass tune from Ola Belle Reed ("High On a Mountain"), the 18th Century American hymn "God Be With You", 2 traditional pieces ("Barbara Allen" and "This Is My Father's World") and 3 Douglas originals. Don't expect dirges or mournful blues - this music draws one in with its lyricism and, as you listen closer, you'll notice the richly melodic work of Mitchell, the highly expressive work of Irabagon (who proves yet again he does not need to roar to catch the attention of the listener) and the strong counterpoint and support of Ms. Oh. The band pushes quite hard on the original piece "Middle March" (Royston at his most explosive) and displays a gospel fire on "Going Somewhere With You" (another original). Ms. O'Donovan's voice is, at times, hushed and reverential yet she does not hold back on the rocking "High On The Mountain". Listening to her sweet intonation on "Barbara Allen" (working atop and with the smart arrangement of the trumpet and saxophone), one can imagine sitting on a big back porch on a warm autumn day. She's not a jazz singer yet her readings of the words move so easily with the musical worlds Douglas creates that it sounds as if she has sung with this group for years. "Be Still" may strike some as a tribute album but it is much more than that. Over the course of 18 years and 36 recordings, Dave Douglas has explored many different sides of creative music. His music never sounds forced or phony; rather, his constant exploring and inquisitive mind allow the listener keen insights into his inner being. This music brings us very close to the center of his soul, on a journey with 4 sympathetic musicians and a lovely voice, all of which resonates long after the last notes fade. For more information, videos and audio selections, go to www.greenleafmusic.com. Although we have never met or talked on the phone, I consider Jason Crane (pictured left, photo by Seth Freeman) a friend. We have several mutual interests, jazz and poetry as well as being involved in radio. However, he is an excellent interviewer as one can hear if you go thejazzsession.com and click on any one of the 400+ chats he has had musicians and jazz folk over the past 5 years. Mr. Crane has talked to musicians who have been around many decades and influenced so many young players, folks such as Sonny Rollins, Jimmy Heath, Jack DeJohnette, Gerald Wilson, Ron Carter and Wadada Leo Smith. He has also shone his spotlight on younger musicians just finding their way through the complicated landscape of creative music but who so obviously have gifts we should not ignore - here I am thinking of people like Kate McGarry, Melissa Stylianou, The Wee Trio, Darcy James Argue, Amy Cervini and many, many others. If you look over to the right of these words, you'll see the 3 latest downloads from The Jazz Session - the one on top reads "A Special Announcement." Within the first few seconds, Jason Crane tells us "I’ve decided to end The Jazz Session." He goes on to explain why, all of which makes sense because, even though the podcast is listener-funded, he just cannot afford to carry on - though the show is first-class, Jason Crane has no permanent address, no other paying gig, and is separated from his 2 young sons. Not asking you to feel sorry for him, just want you to know there are people out there doing what they really love to do and who sometimes have to walk away from it. Those of us who love jazz will miss The Jazz Session, but, after the end of October 2012, the show lives on in its archives. Check it out and say "thank you." You Got Alive a Little, Alive a Lot! The trio of Kris Davis (piano), Ingrid Laubock (tenor saxophone) and Tyshawn Sorey (drums percussion) come to Firehouse 12, 45 Crown Street in New Haven this coming Friday September 21. Collectively known as Paradoxical Frog, they play music that is challenging, exciting, multi-directional and dynamically impressive (truly "a whisper to a scream.") They have 2 CDs, both issued on Clean Feed Recordings, but seem to thrive better in the "live" setting. Paradoxical Frog plays 2 sets - 8:30 and 10 p.m. - and you can find out more by going to firehouse12.com or calling 203-785-0468. To get a taste of the trio's music, go to ingridlaubrock.com/paradoxical-frog-the-band.html. If hot guitar licks and soulful blues grooves are more to your liking, the Robert Cray Band is in the midst of a tour that brings the quartet to the Warner Theatre in Torrington this Friday. 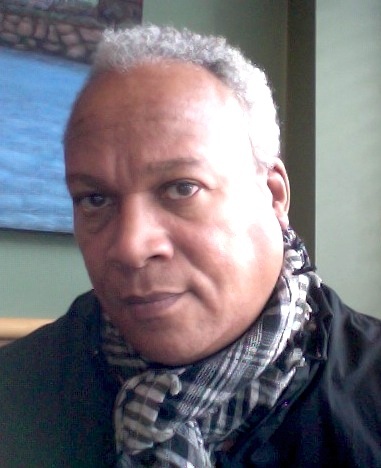 Cray, who's been on the concert and club circuit for nearly 4 decades, just issued his latest CD, "Nothin' But Love" (Nozzle Records) and it is his best in years. Featuring his crackling solos and chunky rhythm work as well as his r'n'b-influenced vocals, the 11 tracks (several of which feature excellent horn arrangements) jump out at the listener for their creative take on the blues. Bassist Richard Cousins, an original member of the group, rejoined the RCB several years ago and reviews have said that the group sounds revitalized. Rounding out the RCB is Jim Pugh (keyboards) and the hard-rocking drums of Tony Braunagel (who joined the band around the time Cousins returned.) Enjoy the hits ("Strong Persuader", "Phone Booth" and "The Forecast (Calls for Pain") but check out the new material. Opening the show at 7:30 p.m. is guitarist Kenny Wayne Shepherd and his Band - Shepherd burst onto the blues scene with a huge bang early in the 21st Century and continues to grow as both a player and composer. For ticket information, go to www.warnertheatre.com or call 860-489-7180. New Zealand-native, saxophonist and composer Jasmine Lovell-Smith brings her quintet, known as Towering Poppies, to The Buttonwood Tree, 605 Main Street in Middletown, for an 8 p.m. hit this Saturday night September 22. Ms. Lovell-Smith, newly ensconced in Wesleyan's Masters in Music program, just issued her debut American CD, "Fortune Songs" (self-released) with her fine ensemble that features Russell Moore (trumpet), Cat Toren (piano), Patrick Reid (bass) and Kate Pittman (drums.) It's a fine group of original compositions, with smart arrangements, strong playing and great promise. Ms. Lovell-Smith started out on tenor saxophone and, just a few years ago, moved to the soprano saxophone where she has already developed a lovely tone (with echoes of both Jane Ira Bloom and Branford Marsalis.) To learn more about her and her fine band, go to www.jasminelovellsmith.com. For ticket information, go to buttonwood.org. Stephen Haynes, he of the expressive cornet and trumpet, and Joe Morris, guitarist, bassist and now author (see below), are the catalyst behind the fine "Improvisations" series held on a regular basis (monthly) at Real Art Ways, 55 Arbor Street in Hartford. On Saturday September 15, the new "season" begins with the dynamic bassist Mark Dresser joining Mrs. Haynes and Morris for an evening of musical explorations. The program opens at 7 p.m. with a solo set by Dresser, who has been a mainstay of the international creative music scene for 3 decades. He's worked with Professor Anthony Braxton, saxophonist Joe Lovano, trumpeter Dave Douglas and has co-leads several ensembles including Trio M (with Myra Melford and Matt Wilson) and Mauger (with Rudresh Mahanthappa and Gerry Hemingway.) Dresser has issued a number of CDs as a leader, has composed scores for dance and digital artists and is known for his fearless sonic experimentation. After intermission, Haynes and Morris will join Dresser in a freely improvised set. For more information, go to www.realartways.org or call 860-232-1006. For more information, go to www.aumfidelity.com/riti.htm - you can order the book or just read more about it. Fans of creative music can rejoice - the Firehouse 12 Fall 2012 Concert Series commences this Friday at 8:30 p.m. First up is the E.J. Strickland Quintet in his 3rd appearance in the Elm City's premier performance space/recording venue but his initial date as a leader. The drummer/composer (pictured left) has worked with numerous groups and performers over the past dozen years, including regular gigs with saxophonist Ravi Coltrane as well as vocalists Nneena Freelon and Dianne Reeves. He, also, is the main motor in his twin brother Marcus Strickland's ensemble. Brother Marcus (tenor and soprano saxophones) is also part of EJ's crew along with David Bryant (piano), Jaleel Shaw (alto saxophone) and the splendid young bassist Linda Oh. He has issued 1 CD as a leader, "In This Day" (StrickMuzik 2009) yet that recording illustrates not only his impressive musicianship but also his fine composing and arranging skills. The music, not surprisingly, has plenty of power yet this drummer writes melodies that are much more than riffs to hang solos upon. The concert features 2 sets - 8:30 and 10 p.m. (separate admission). Firehouse 12 is located at 45 Crown Street in New Haven - for more information, go to firehouse12.com or call 203-785-0468. Pianist George Cables has had a long career as both a leader and a sideman (currently he holds down the piano chair in The Cookers.) He came to critical notice in the 1970s working with Bobby Hutcherson, Art Pepper, Woody Shaw and Joe Henderson as well as being closely involved with Dexter Gordon on his triumphant return to the United States. He went on to work with trumpeter Freddie Hubbard. When you pay attention to Cables' piano, it is easy to understand why musicians hire him - he can and does play any style plus his solos are intelligently constructed. His new CD, "My Muse" (HighNote Records), is a more personal project in that the music is dedicated to his long-time companion Helen Wray who passed in November of 2010. With bassist Essiet Essiet and drummer Victor Lewis, Cables paints a loving portrait, long on melody, short on dissonance and filled with spirit. The title track, one of 4 Cables originals, is a bouncy strut with a touch of a Caribbean beat; it is preceded by another original, "Helen's Song" that has a gentle sway, a hummable melody, and lovely counterpoint from Essiet. Lewis doesn't push the beat as much as keep it simple and flowing (like the piano part.) It's not surprising that the program is geared towards love songs but there is not a maudlin or false note in these performances. As opposed to playing a bravura ballad rendition of "The Way We Were", the trio gives it a lively yet respectful swing. The trio dances through "You're My Everything", giving the Harry Warren melody a lively jolt. Drummer Lewis contributes the sprightly "Hey, It's Me You're Talkin' To" with a great vamp that Cables build his impressive solo off of, leading to a short yet pithy statement from the composer. The CD opens and closes with 2 short piano solos. The opening track, "Lullaby", a Cables original, is just that, a sweet piece with a fine two-handed melody line and high, minor key, notes that resonate long after the piece fades (it's the only hint of sadness on the CD.) "I Loves You, Porgy" is the last piece, a gentle reading with lines that rise and fall like breathing, coming to its soft ending far too soon. 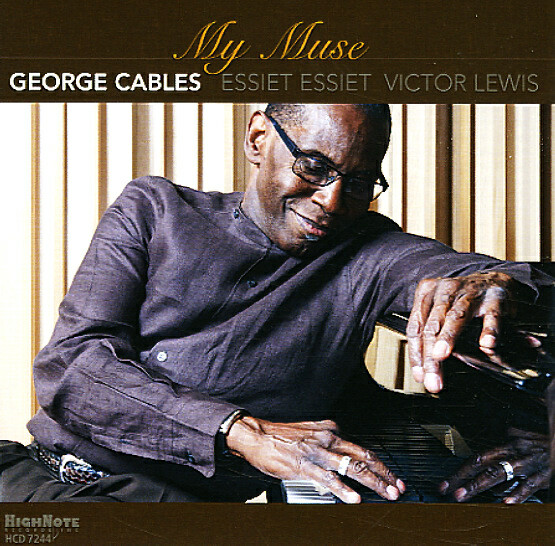 Reading the liner notes while listening to "My Muse" may suggest a melancholy recording yet George Cables infuses this music and his memories with the finer qualities of his partner Helen Wray. One hears joy, caring and love in these performances. And there's swing, a touch of blues, Island music and so much more, elegantly played by Messrs. Cables, Essiet and Lewis. For more information, go to www.georgecables.com. The multi-instrumentalist, composer, and educator Sam Rivers would have turned 89 on September 25th of this year. He passed in 2011 on the day after Christmas, leaving behind a legacy of music that spanned nearly 6 decades. His Blue Note recordings from the 1960s still sound contemporary;, in fact, none of his music sounds dated. He was active well onto his 80s, leading a big band as well as a trio. Pi Records is set to issue (on Sam Rivers' birthday no less) "Reunion: Live in New York", a 2-CD concert recording from May of 2007 that was the culmination of week-long festival held in New York City by radio station WKCR. Rivers, who during the course of the 2 sets (approximately 90 minutes), plays soprano saxophone, tenor saxophone, piano and flute. He is reunited with the rhythm section of Dave Holland (bass) and Barry Altschul (drums), an aggregation that had not worked together on a regular since the late 1970s. On this night, Rivers, Holland and Altschul stepped out onto the stage and started to play; there was no sheet music, no planning beforehand, no "greatest hits" package, just 2 sets of improvised music. When one writes "improvised music", it is often translated as "free music" or, sadly, "noise with no direction." Yes, it is "free" in that the musicians' creativity determines the directions but the sounds this Trio makes is not pure noise; in fact, it's a conversation of the highest order. River stepped on stage knowing that Holland and Altschul would push him to heights of creativity (and vice versa.) Holland moves this music in various directions, often riding alongside the flowing (and bouncing) beat of the drummer. His bow work is pristine and the melodic counterpoint he creates through the program is quite impressive. When he locks into the drummer's groove, the music accelerates and leaves the ground. For his part, Altschul drives this music with abandon but not fury. His cymbal work is smart, his snare has a snap that reverberates and one can hear a "dancing" quality in his solos that is reminiscent, but not a slavish reproduction, of the work of the late Ed Blackwell. Mr. Rivers opens the first set on tenor sax moving to soprano and flute for the second half of the set. The mesmerizing beat and booming bass lines on the final piece underscore the soprano and flute, reminding this listener of Holland's classic "Conference of the Birds", his 1972 ECM Lp. The second set (CD 2) opens with a powerful bass solo, then adds Altschul's fine brush work beneath Mr. Rivers' exciting flute lines. His dialogue with the drummer gives way to Altschul creating melodic phrases on the floor toms while Holland creates an arco drone at the 7 minute mark. The flutist returns with a short, unaccompanied, solo, his lovely breathy tones on lines that swing and move in unexpected directions. After a short bass solo, the flute gives way to tenor saxophone. The trance-like swing of the rhythm section in the final moments of the second track is mesmerizing. The fiery interplay of tenor sax with the bass and drums in the middle section of the final track hearkens back to but does not repeat the opening moments of the first set. One should listen to this music in its entirety; it's easier to follow the flow if you (literally) just go with it. "Reunion" is joyous music that can't help but remind one just how fine and creative a person Sam Rivers was. Dave Holland and Barry Altschul carry on in his tradition, one that began with the birth of jazz and shows no signs of disappearing. For more information, go to pirecordings.com or www.rivbea.com. This coming Saturday (September 8), the Uncertainty Music Series welcomes back guitarist/composer/producer Michael Gregory for an 8 p.m. performance in the compact music space of Never Ending Books, 810 State Street in New Haven. Gregory, who came to critical notice in the 1970s as an avant-garde musician playing with saxophonist Oliver Lake and trumpeter Baikida Carroll, brought a style informed as much by rhythm 'n' blues as by "free jazz." Originally appearing under the name of Michael Gregory Jackson, he dropped his last name (for obvious reasons) and seemed to disappear in the late 80s and 90s. In fact, he was producing music that blended his interests in dance music and electronics, releasing a series of recordings on very small labels with limited distribution. In the middle part of the last decade, Gregory began working with trumpeter/composer/conceptualist Wadada Leo Smith appearing on several of his recent CDs. 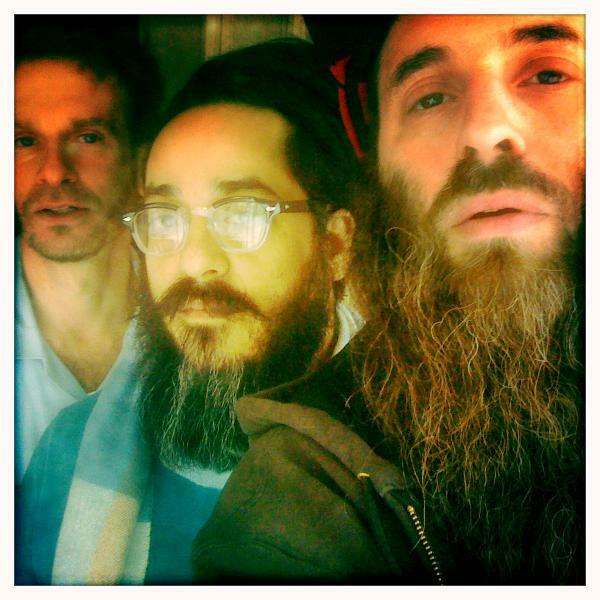 When he appeared in New Haven earlier this year, he played a solo set - this time, Gregory is joined by bassist/series curator Carl Testa and drummer Andrew Drury. Opening the evening will be Banjo Assault, a duo featuring Tom Crean and Matt Robidoux. This concert celebrates the 5th anniversary of the Uncertainty Music Series. For more information, go to uncertaintymusic.com. Speaking of anniversaries, the Many Colors of a W*O*M*A*N Jazz Festival celebrates its 25th this Saturday at 8 p.m. The music begins at 8 p.m. and takes place in the Liberty Christian Center, 23 Vine Street in Hartford. For more information, call 860-231-0663 or go to www.themanycolorsofawomanincorporated.webs.com/ . Much of the press that one reads on Fred Hersch concentrates on his recent illness and subsequent recovery (and deservedly so - it's a been a long, harrowing road back.) After 4 weeks of playing selections from his new double CD, "Fred Hersch Trio: Alive at The Vanguard" (Palmetto Records), it's time to put the talk of his travails away and concentrate on what a fine pianist, composer and bandleader he is. With bassist John Hébert and drummer Eric McPherson as equal partners in this venture, Hersch's music bristles with crisp interplay, is ripe with fine flights of melodic invention and displays the depth as well as the breadth of Hersch's musical mind. Recorded during a week of gigs at The Vanguard in February of this year, the material includes classics like Ornette Coleman's "Lonely Woman" paired with Miles Davis's "Nardis", Charlie Parker's "Segment" and Sonny Rollins' "Doxy" (and that's just on Disc 1!) There are 7 Hersch originals, ranging from the ethereal "Dream of Monk" (from the pianist's new major work "Coma Dreams") to the fanciful "Jackalope" (a mythical beast that roams the Southwest of the United States). The last of 3 tracks that pair tunes, "The Song Is You" is a simple yet beautiful ballad from Jerome Kern and Oscar Hammerstein II (composed in 1932 for the musical "Music In The Air) that segues into Thelonious Monk's faster-paced "Played Twice" - Hersch's unaccompanied opening is a wonderful 2-handed romp that spans all 88 keys. There are moments when his right hand dances to the highest notes while his left dips down to the keys that control the thicker piano strings . The finest creative music makes the interested listener want to listen to it time and time again. On the first few times through "Alive at The Vanguard". you may catch the fine drumming and bass work without appreciating how much piano Fred Hersch is playing. When the Trio is in high gear, there are moments when it seems each musician playing at his highest level. And there are moments on the ballads when one hears how Hébert is really listening to the chords Hersch is playing and reacting instantaneously with his own melodic invention. This is music that resonates long after the applause has dies down; this is music that is both exciting and soul-satisfying. The CD hits digitally and physically on September 11. 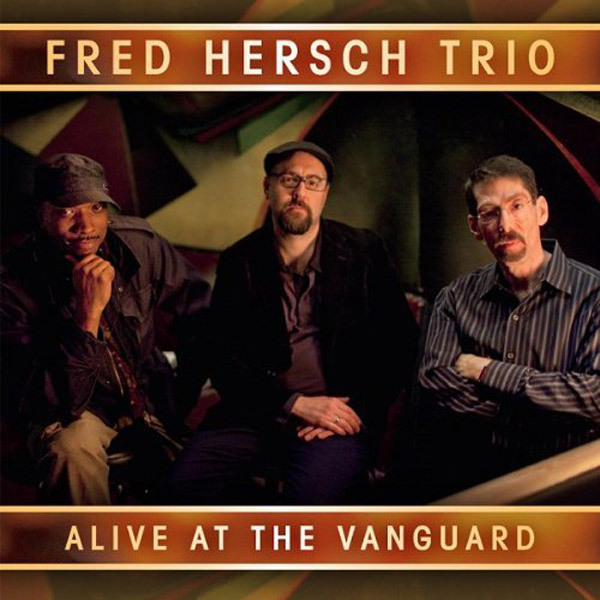 As I write this, the Fred Hersch Trio has just begun a tour that includes residencies at The Village Vanguard (9/11-16) and Chicago's Jazz Showcase (9/20-23). After a solo piano tour of England in early October, the Trio will play at Firehouse 12 in New Haven, CT, on October 26. For more information about these dates and more (including a performance of Hersch's "Leaves of Grass" in Chicago on October 21), go to www.fredhersch.com. To check out the CD, go to www.palmetto-records.com. Israeli-born, Berklee College-educated and road-tested, Anat Cohen is one of the more vivacious and exciting performers on the music scene. Originally a tenor saxophonist, she has increased her arsenal of reeds to include soprano saxophone and clarinet. "Claroscuro", her 6th CD as a leader released on her Anzic Records label, features her long-standing quartet of Jason Lindner (piano), Daniel Freedman (drums) and, replacing Omer Avital on bass, Joe Martin. The title of the program refers to the Italian word "chiaroscuro" a painting technique that combines dark and light elements. Ms. Cohen's music often moves effortlessly from darker, intense, music to pieces that swing with joy or ballads that sway gently. This CD, self-produced with the aid of Lindner and Freedman, contains music from a wide spectrum including Lindner's percussive "Anat's Dance" that opens the program to the swirling South African rhythms of Abdullah Ibrahim's "The Wedding" that closes it. In between, guest such as trombonist Wycliffe Gordon and clarinetist Paquito D'Rivera combine their distinctive voices with the quartet to create music that sings, soars, and brings a smile. Gordon's growling 'bone is a fun foil to Ms. Cohen's raucous clarinet on the ever-so-slow "La Vie En Rose" - the trombonist puts more than just a pinch of Louis Armstrong in his sincere vocal (thankfully, he did not try to channel Edith Piaf.) He returns on Dr. Lonnie Smith's "And the World Weeps", his unaccompanied multi-phonics introducing the song that soon falls into a slow, New Orleans, drag. To their credit, the clarinetist (here, it is D'Rivera), tenor saxophonist and trombonist play the melody fairly straight; Gordon's solo sounds like a man fighting the darker forces, blending low guttural utterances with softer, higher-pitched phrases. D'Rivera enters in a classic Johnny Dodds mode before Ms Cohen's tenor adds a chorus of deeply felt blues playing. The twin clarinets of Ms. Cohen and D'Rivera do a rousing version of Artie Shaw's "Nightmare", prodded by Freedman's pounding drums, Lindner's rumbling piano and Martin's throbbing bass. The manner in which the clarinets intertwine is sensual as well as conversational. Ms. Cohen moves to bass clarinet for her original "Kick Off", a piece for her, D'Rivera and the percussion of Freedman and guest Gilmar Gomes. Gomes' active percussion takes that piece out and then leads the Quartet plus Rivera into a fiery reading of "Um a Zero", a fine choro from the pen of Pixinguinha, a flautist/saxophonist/composer active in Brazil through the middle decades of the 20thy Centur. Gomes also appears on "Tudo Que Você Podia Ser", another Brazilian composition, this one composed by and made famous by Lô Borges. Here, it is Ms. Cohen's expressive soprano saxophone dancing atop and alongside the dancing piano of Lindner. "Claroscuro" shines brightly with its intelligent variety of rhythms, melodies, and superb interplay. Anat Cohen and these fine musicians play with such exuberance and soul, it's hard not to move your feet on the faster tunes and lean in closer on the ballads. Having seen Ms. Cohen on a number of occasions in various ensembles that she has led or co-led (3 Cohens, with her brothers Yuval and Avishai), she always gives a maximum effort - this CD, scheduled on September 25, is yet another excellent example of her prodigious talents. For more information, go to www.anatcohen.com or anzicstore.com. More highlights include the leader's handsome solo on "#11" and Rojas's long, low, tones that lead in "Ging Gong" (his solo in the middle of the track is joyful and quite melodic.) The foursome's interaction on the CD closer "Urban Groovy" sounds as if they are effortlessly gliding across a ballroom dance floor. The muted trombones on the opening section of the leader's "The Crab" feel like heraldic trumpets and move the piece along to a fine melody with hearty as well as heartfelt solos from Fiedler and Roseman. One might look upon "Joe Fiedler's Big Sackbut" and think that there's not much of a sound palette. You should be quite surprised and pleased at how this music moves gracefully and melodically throughout the 10 tracks; yet the pieces also take many rhythmic paths during the program. No doubt about it, this CD is a "wind-win" situation. For more information, go to www.joefiedler.com.